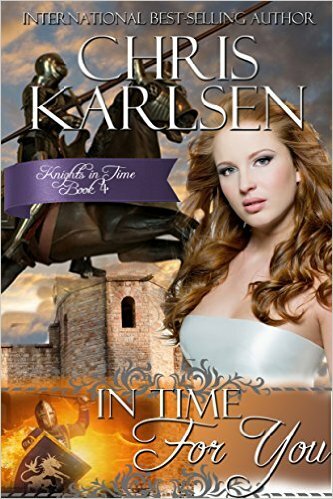 Another great read in the Knights in Time series. I really love this series and I was looking forward to reading more of Roger's story. This fourth book is a little bit different in that we don't see the progression in Electra and Roger's relationship. They meet at the end of book 3 and by the beginning of 'In Time For You' Roger is already preparing to propose to her. I missed seeing their courtship and falling in love. There is a secondary romance involving Emily and Simon although it too is quite fast paced. As I had already read the first three books and knew what would happen when the girls get caught up during thunderstorm, I found all the detail and questioning surrounding their disappearance to be a bit drawn out. When the setting changed to medieval England, the pace of the novel sped up. I loved reading how Electra and Emily adjusted to their new time period and how they carved out a place for themselves. I found the secondary characters to be quite charming, in particular the two guards who were charged with escorting Electra around. They were quite funny and cute when they were competing with each other for her affections. I'm really hoping that they'll appear again in subsequent titles. Towards the end of the story I was beginning to think that medieval England was going to be left with a shortage of knights, however the author manages to balance things out a little bit with a twist at the end. I'd recommend this whole series and I would suggest reading it in order and in its entirety.